FREE Shipping within Cont. United States. This one of a kind didgeridoo (in the photo) is the exact one you will receive. Crafted in Australia by Aboriginal family Naiuwa. Includes: Didgeridoo and FREE Instruction DVD. This didgeridoo was crafted in Australia from start to finish by Aboriginal family Naiuwa. It has a high gloss protective finish that lets the wood grain show through. Each Naiuwa Didgeridoo is a unique one of a kind piece of art - and as such - is signed and dated with the year. The didgeridoo pictured is the exact one you will receive. This didgeridoo has a brand new beeswax mouthpiece. The beeswax mouthpiece brings the diameter of the didgeridoo down to the perfect size and shape - ready to play out of the box. Naiuwa Art is an Indigenous family owned business of Yiddinjii (Babinda Boulders area NQ), Budjula and Kabi-Kabi (Frazier Island/Hervey Bay and areas of south east QLD) tribal heritage. They have become known nationally and internationally as makers of top quality didgeridoos. 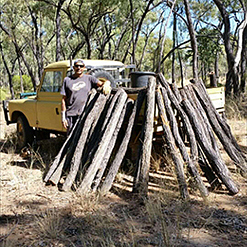 They create authentic didgeridoos from carefully chosen, naturally termite hollowed eucalyptus trees. 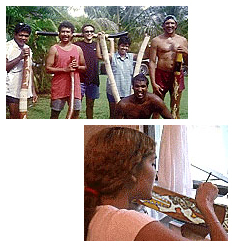 Gerald Appo and his family work together to create their own unique wood burnt and dot painted didgeridoos. Every didgeridoo is carefully sealed inside and out to preserve the instrument. The artwork for each didgeridoo is chosen individually taking into account the shape, size and musical tone. Each one has its own unique look and feel. Naiuwa means "green turtle" which is the nickname given to Gerald by Aboriginal youth he works with. He feels strongly about helping his community. The patience that earned him the nickname Naiuwa can be seen in all of their didgeridoos. We purchase our didgeridoos straight from Naiuwa in Queensland Australia. They are good friends of ours. Ordering direct allows us to make sure the didgeridoos we purchase are at a fair trade price that is set by them. Feel good knowing your purchase helps support their Aboriginal owned family business. If you have any questions about this didgeridoo or would like to hear it played for you over the phone please call us at (559) 642-6434. A didgeridoo is traditionally made from one of many species of eucalyptus branches or saplings. Species of eucalyptus number in the hundreds but only about a dozen species are used for didgeridoo making. The eucalyptus is naturally hollowed out by termites whose nests abound in the millions in Australia. It takes at least a year for the termites to hollow a tree out. It has to be "just right". The varying length of the wood that is sawed off and its thickness and shape will determine which key the instrument will be in. Typically shorter lengths yield higher pitches, longer lengths yield lower pitches. Didgeridoos generally range in keys from a high "G" to a low "A". Harvesting has to be timed so that the wall thickness of the instrument is not too thin or not too thick. Making for the perfect instrument. Backpressure: the resistance of air you feel from the inside of a didgeridoo while you are playing it. Usually small diameter tubes have more backpressure and large diameter tubes have less. Good backpressure allows you to circular breathe more easily and be efficient with your air flow. Harmonics: the didgeridoo has a fundamental key. Harmonics are higher frequencies found within the fundamental key. They can be manipulated by the placement of your tongue while playing. For example, while playing the didge position your tongue like saying the letter "e", but do not use your vocal cords. This will create a harmonic. Vocals: vocal response is the ability of the didgeridoo to project sound from your vocal cords while playing the drone. Usually larger diameter didges have better vocal response than smaller diameter didges. Volume: the amount of sound that is produced.